Comments: When I saw this pistol in the Gletcher catalog, I did not realize how large it actually was, I was expecting the Gletcher APS Stechkin to be a bit larger than the Makarov but it really does dwarf the Makarov. Being that it is a large pistol it does have some weight to it but it does not feel heavy for its size. The grips are long front to back but not overly thick side to side so even medium sized hands should be OK shooting this BB air pistol. I am really happy to see another historic airgun added to the available Replica Airguns at our disposal. 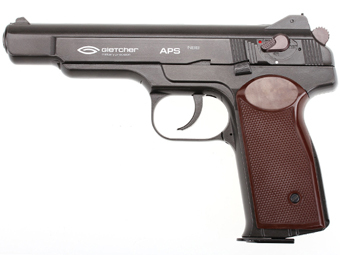 Let's hope the Gletcher APS Stechkin shoots as well as it looks!